UMAC - United Martial Arts Centers franchise business opportunity. Free UMAC - United Martial Arts Centers business franchise information. The United Martial Arts Centers franchise concept is founded on a passion for the martial arts, and a love of teaching Tae Kwon Do. We are currently seeking individuals who share our goals and have an active interest in changing lives for the better, not just kicking and punching. Our comprehensive training and support programs will assure that approved franchise operators will have the tools they need to run their own martial arts school. The UMAC franchise program is a great opportunity that leverages positive trends in the fitness industry and the popularity of martial arts in the <?xml:namespace prefix = st1 ns = "urn:schemas-microsoft-com:office:smarttags" />U.S. Our martial arts training programs appeal to a wide range of students; male and female, young and old. The UMAC management team has ample business experience and expertise in Tae Kwon Do training and special programs. United Martial Arts Centers are established businesses, currently operating in several states and teaching hundreds of students. Take the next step toward your future in martial arts and as a business owner! A United Martial Arts Centers franchise provides you with the opportunity to own and operate your own martial arts school, but with the benefits of the expertise and support of an experienced team of Tae Kwon Do masters and seasoned professionals. You'll be in business for yourself, but not by yourself. The market in which the United Martial Arts Centers program operates provides an incredible opportunity for franchisees. There are an estimated 2 to 3 million people who practice martial arts in the United States alone, and about 40 percent of them are children between the ages of seven and fourteen. 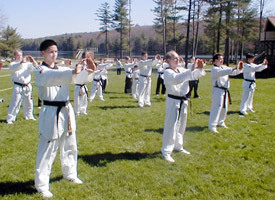 With Tae Kwon Do officially adopted as an Olympic sport in recent years, the popularity of and demand for quality martial arts training, and Tae Kwon Do in particular, show no signs of diminishing. Do I need to have studied Tae Kwon Do to be a franchisee? Previous studies in martial arts are definitely a big plus. But we also look for franchisees that have strong business management skills, respect for others and a solid work ethic, plus a dedication making a difference in students' lives. How much will the United Martial Arts Centers franchise investment cost me? The estimated initial investment is $180,000. As with any new business venture, it's important that you have the capital needed to adequately fund your new business. What will I receive as part of the United Martial Arts Centers franchise system? You and your key staff will complete training at our headquarters, plus you'll get pre-opening help at your own center. You'll have access to all the United Martial Arts Centers programs and materials. And, you'll receive, among other things, a detailed operating manual and the rights to use our trademarks. To learn more about the UMAC - United Martial Arts Centers franchise opportunity, simply complete the form below.